UPDATE: below information has been updated based on feedback, thanks. Please feel free to add or correct. It is not clear at this time what the exact differences are between RM-1065 and RM-1096. Last edited by Woodman1914; 07-05-2015 at 02:48 PM. oldpueblo and Exotic Hadron like this. - model number: RM- ? I'm not sure on the model numbers, for example I don't know what the RM number is for the dual-SIM no LTE, or for RM-1065, Newegg describes it as USA LTE, and it seems to be single-SIM. However, that doesn't seem to match the more limited LTE bands shown on Microsoft's website, so could there be multiple variants of single-SIM LTE? Does anyone have a single-SIM LTE version that gets 4G connections in the USA? Would appreciate anyone who can clarify. To be honest, I was a bit confused myself. I went off this list I found here. Thanks for the link, I'll update my post with that, although it doesn't mention RM-1096, which is what I got from Expansys. This kind of stuff drives me nuts, there have to be differences between RM-1096 and RM-1065 and I wish they were much more up front about what they are. Thanks for starting this thread, I'll be watching to see which one I should get for AT&T. That RM-1096 has eleven LTE bands?! I guess the version AT&T will sell will have many less than that, not to mention the single SIM slot. This is very tempting, should I spend ~$250 now for a 640XL dual SIM LTE, or save for that elusive flagship with Continuum. I was faced with a similar choice, but I figured it'll be a while, maybe until the middle of 2016 before the flagship prices drop somewhat, hoping the 640XL will keep me satisfied until then or longer. I know what you mean. If you're with ATT, I guess you could get either one based on what's cheapest. I've had the same model you ordered for a week, and it does work on AT&T's network. I powered it up, and it registered full LTE, with no issues. It's a very nice phone. Does the visual voicemail work for you on AT&T? Thinking about getting one as well. I don't think dual SIM version would have visual VM. If you get a single SIM, you should have it, I think. Why would that be? Do you have any information to back up that theory? Not a theory. I do own a 640xl DS LTE. What I should have said is that it should work on a single sim version. How can you tell if it has connection with AT&T's LTE? I just got mine today and am getting quite frustrated. Look at the very top left corner of the screen, you should see a very small 1 indicating SIM slot 1, and then 5 ascending bars from left to right indicating cellular signal strength, then next to that, your cellular data speed connection. If it's 4G or LTE, it'll say 4G. See this picture as an example. 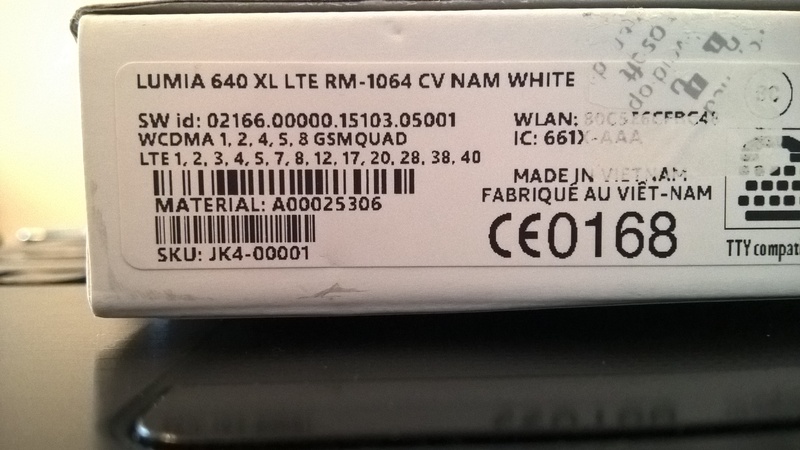 slight correction on the RM-1064, it does support USA LTE bands. Woodman1914, digitalicecream and Exotic Hadron like this. Excellent, thank you for the picture. I'll update my post. Well I ordered a white one today. Will be testing the 1096 on AT&T in the 95821 area code which is fairly centralized, as well as 95624 which is pretty remote. If this works I'll be very happy, if not I'm going to be broken hearted and my little 635 will be put back to work. I just setup my RM-1096. I see that it covers many LTE bands, but ATT tells me that based on the IMEI that I will only get band 17 (700mhz) on this phone. I had another phone next to it and it was getting LTE, while my RM-1096 was only getting 4G. So I worked with ATT for a long time and they said my new phone is not "provisioned" to use any other ATT LTE band. If this is true, it seems that I could miss a lot of LTE service, when there are many other ATT LTE bands available. How can I make sure my phone will use all ATT LTE bands in the US? AT&T told them the phone wasn't "provisioned" to use bands other than band 17. That sounds like AT&T is deliberately blocking LTE support on other bands in their network. But I don't understand why they would block everything except band 17. Any thoughts on a workaround for this? Was really thinking about picking one up, but am a little hesitant now. You should do a speed test. I think people are saying that the 1096 displays 4G when it's getting LTE. That doesn't sound good, maybe it's ATT's way of selling carrier branded phones. Please keep us posted on this. Reminder for anybody who's forgotten, 4G *is* LTE everywhere but North America. If you see "4G" displayed on a non-US market phone, you are getting LTE signal. Sedp23, Exotic Hadron and Captain_Eric like this. I would, but I don't have one. Was looking to buy because Expansys has them at $199 and then saw the forum post. Just saw this. Thanks for the feedback. How do I get a download to use Google Play apps for my Lumia 635? Why is my screen freezing when it is locked? How many Apps are installed in your Lumia ? and corresponding battery backup ?